a bitter, tart, and sweet glaze. Light the grill. In a small bowl, combine the garlic. grapefruit zest, grapefruit juice, oil, honey, salt, and pepper. In a small stainless steel saucepan, bring the remaining glaze to a boil. Boil for about 1 minute, remove from the heat, and pour over the grilled chicken. Since the chicken breasts don’t have a l;ot of sauce, serve a juicy vegetable such as grilled or sauteed summer squash or zucchini alongside. Use a combination of citrus juices, such as orange, lemon, or lime instead of all or part of the grapefruit juice. 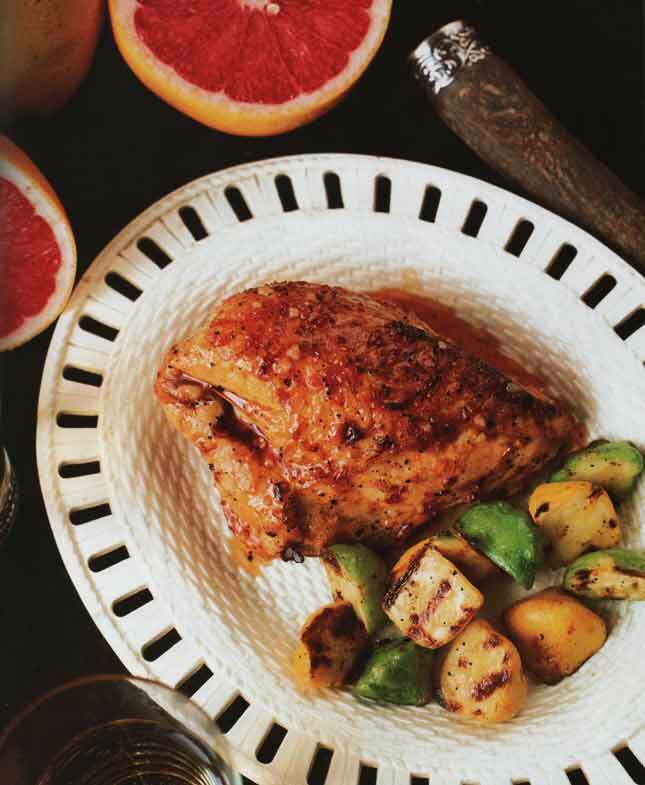 The crisp acidity, effervescence and moderate alcohol level of a brut Champagne from France or a sparkling wine from California will be perfect with the smoky taste of the chicken and with the high acidity of the grapefruit juice. Put the steak in a glass or ceramic dish and add the marinade, turning the steaks several times to coat. Cover and refrigerate for 4 to 8 hours. Prepare a charcoal or gas grill. Lightly spray the grill rack with vegetable oil cooking spray. The coats should be moderately hot to hot. Lift the steak from the marinade, letting the marinade drip back into the dish. Grill the meat for 8 minutes, brushing several times with the marinade during the first 5 minutesof grilling. (The oil in the marinade may cause flare-ups). Turn and grill for 8 to 10 minutes longer until medium-rare, or until it reaches desired degree of doneness. Let the meat rest for a few minutes. Place the onion slices near the outside of the grillaway from the most intense heat, brush with oil, and sprinkle with the pepper. Turn once or twice, brushing with more oil, and grill for 8 to 10 minutes, or until the onions are lightly browned and tender. While they cook, wrap the tortillas in foil, place the packet on the outside edge of the grill, and let the tortillas warm while the steak and onions are cooking. Slice the steak into strips and separate the onions into rings. 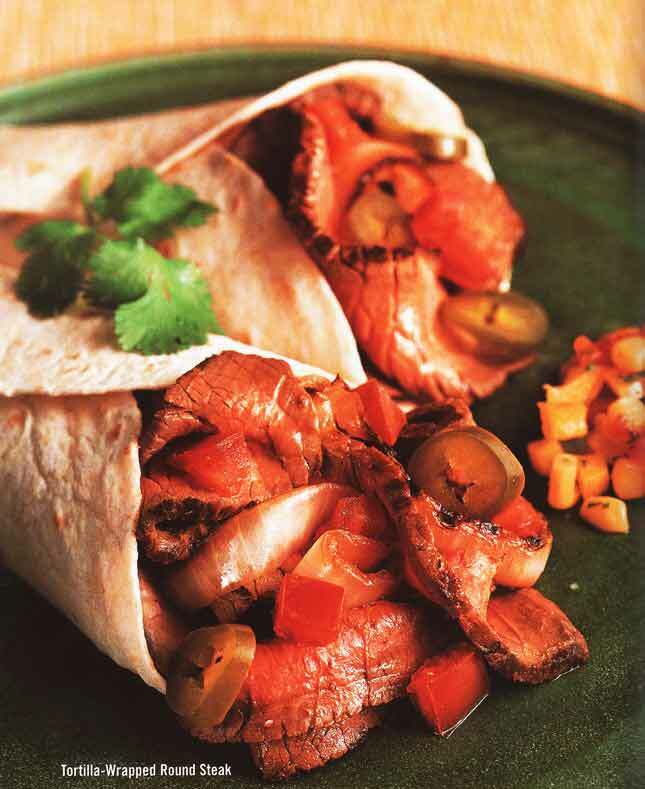 Arrange the steak, onions, chopped tomatoes, and jalapenos in the tortillas and wrap into a sandwich. Garnish with cilantro and top with salsa, if desired. Toasting spices enhances their flavors and this marinade, which combines some of the classic flavors of Asia, is wonderful with chicken, beef, you name it. Whisk together all the ingredients in a glass or ceramic bowl until blended. Adjust the seasonings. Use according to the recipe, or cover and refrigerate for as long as 2 days. Note: To toast the cumin seeds, spread them in a dry skillet and toast them over medium heat, shaking the pan to prevent scorching, for 4 to 5 minutes, or until fragrant. Transfer the seeds to a plate to cool and stop the cooking. This type of salsa, made with fresh with chopped tomatoes, bell peppers, and herbs, is a classic salsa fresca – which means it’s not cooked. Serve this with just about any meat or poultry. We especially like it on burgers. Combine the tomatoes, peppers, corn, scallions, chillies, garlic, cilantro, lime juice, vinegar, and salt in a glass or ceramic bowl and stir gently to mix. Adjust the salt. Let the salsa stand for about an hour to let the flavors blend. Serve or cover and refrigeratefor several hours. Let the salsa come to room temperature before serving. Note: You can use frozen corn kernels, cooked and cooled. For better flavor, use leftover boiled summer corn, or best yet, grill a few ears over hot coals or roast them in a very hot oven (400 F.) until the huskes blacken, which will take about 15 minutes and require turning several times. Let the corn cool and then slice the kernels from the cobs.